This online course is $275.00 but sign up before March 10th and pay only $250.00! Would you like to learn online hosting skills that help elevate your brand? Perhaps you would like to create your own web series? Get on camera experience, and tools to start hosting your own web series! Learn tricks on how to get a hosting agent that can start sending you on auditions! Learn secrets to nailing every interview you get! Learn the skills to start filming and hosting anything you choose! Discover what your personal “Brand” is to customize your craft and start creating an income! Learn more about yourself and how easy it is to use your own personality to make money on camera! 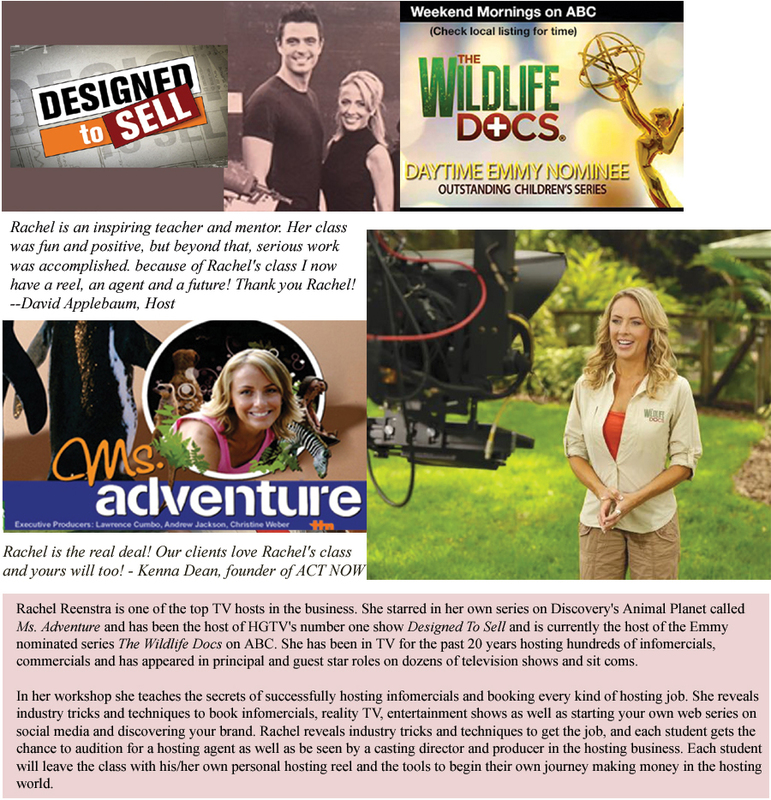 Rachel Reenstra is one of the top TV hosts in the business. She starred in her own series on Discovery's Animal Planet called "MS. ADVENTURE" and has been the host of HGTV's number one show "Designed to Sell " and is currently the host of the Emmy nominated series “The Wildlife Docs” on ABC. She has been in television for the past 20 years hosting hundreds of infomercials, commercials and has appeared in principal and guest star roles on dozens of television shows and sit-coms. Rachel also performs stand-up comedy, and works in numerous national commercial and voice-overs, speaks all over the country and gives classes and seminars when time allows. In her workshop she teaches the secrets of successfully hosting infomercials, reality tv, entertainment shows as well as starting your own web series on social media and discovering your brand. Rachel reveals industry tricks and techniques to get the job, and each student gets the chance to audition for a hosting agent as well as be seen by a casting director and a producer in the hosting business. Each student will leave the class with his/her own personal hosting reel, and the tools to begin their own journey making money in the hosting world. Founder and Owner of ACT NOW!